Why Is Transportation Law Hot? 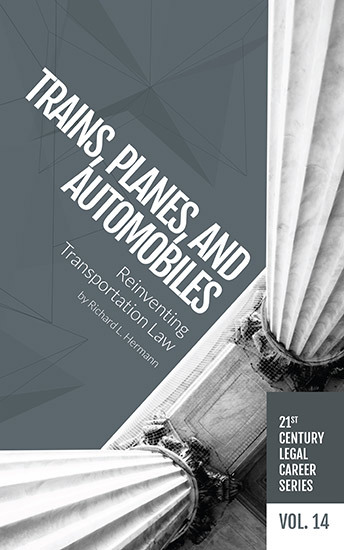 Transportation law is a big topic, a broad tent that Hermann details by breaking it down by modes of travel, anticipating where the opportunities and pitfalls lie for legal employment in each. We are poised on the cusp of the biggest revolution in transportation since the invention of the automobile in the late 19th century — self-driving car and truck technology. This revolution is going to affect everyone’s daily existence and a lot of attorneys’ livelihoods. Volume 14 demonstrates how one of the most important job-search and legal career strategies you can adopt is to understand as much as you can about the technology as well as the law. Those attorneys who do this and understand the “law-technology gap” are in the best position to both secure that first job and continue to rise through the professional ranks. There is little question that driverless cars and trucks, drones and other unmanned aircraft, autonomous ships with minimal or no crews, “trenchless” pipeline technology, and other technological marvels transforming transportation and transportation law are the bow waves of the near future. Their rather sudden emergence has made them leap far ahead of the law’s ability to manage and regulate them. Today, few attorneys have any expertise whatsoever in the rules governing (and developing) any of these new, disruptive technologies. That means opportunity. In this volume, Hermann leads you through this expansive employment field providing strategies and tactics to help you take advantage of on-going and emerging legal career opportunities. Buy the print edition at the NALP bookstore or the electronic version.